Apple's long-awaited iMac Pro has just our doorstep, and we've been hard at work benchmarking and testing it ever since. Here, we offer a closer look at the improved speakers, as well as a comparison of the FaceTime camera. Apple has said that they improved the speakers over the 5K iMac, which is surprising since they're already the best-sounding speakers you can get on a Mac. We've got both in the office, so we decided to put them to the test. Crank your volume up and listen for yourself in the video embedded above. We could hear a wider range of audio frequencies on the iMac Pro. Audio seemed to blend in on the 5K iMac, especially during the guitar solo. Volume has definitely increased, and the Pro sounds more crisp. Bass on the 5K iMac seems messy, like you'd hear with a subwoofer that's reaching its limits, whereas on the Pro, the bass was tight, strong and clean. The iMac Pro also has the first ever 1080p FaceTime camera to come on a Mac, compared to the 720p camera on the 5K iMac. It also has 4 microphones, compared to only one on the 5K iMac. You can instantly tell just how much better the image quality is on the iMac Pro. It makes the camera on the 5K iMac seem ancient. The white balance on the 5K iMac is completely off, whereas the iMac Pro perfectly matches what we saw with our own eyes. The audio on the iMac Pro is much cleaner, but not as loud. 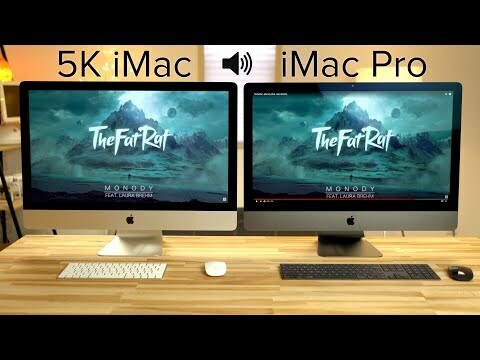 The 5K iMac has a tinny sound to it, with a lacking range of audio frequencies. We did notice, however, that the 5K iMac did a better job at blocking background noise. We've got quite a bit of background noise in our office, so hear it for yourself. We believe this is due to the 5K iMac's single microphone being located on the bottom of 5K iMac, inside the speaker grille. The four microphones on the iMac Pro are all located at the top, and will more easily pick up background noise. We've been running benchmarks and tests nonstop since we got our hands on the iMac Pro, so be sure to subscribe to AppleInsider on YouTube so you don't miss out on our upcoming performance comparison videos. For up-to-date availability and the latest deals, check out our iMac Pro Price Guide. At press time, Abt Electronics has the standard config in stock for $4,999.00 with no sales tax on orders shipped outside IL, IN, MI and WI. How such speakers compare to external ones like Computer MusicMonitor? I dont think people who are buying this computer, care about builtin speakers. The point of an all-in-one is at least partly to minimise desk clutter ... so if the speakers are good enough to make external speakers unnecessary, that would be a real (though of course not primary) feature. I have iMacs at home and work, and already appreciate that I don't absolutely need external speakers for most tasks (sure, for music or netflix, I route the audio to a wireless speaker system). Also, very nice to see the FaceTime cameras are finally getting upgraded ... long overdue. Pretty sad sound - like a cheap boombox - for something that starts at $5,000. Saw the thing in person this week at Apple Saddle Creek. Of course if you grew up listening to low quality Napster MP3 files on earbuds you might not be as picky. This is part of the rap on all in ones. They do nothing particularly well. Can I have a real Mac Pro now? Does FaceTime perform as expected? I’ve used FaceTime on 3 different iMac Pros and the video feed never shows the other party.